ASSAP @ 30: A series of posts summarising what we have learned through thirty years of ASSAP, whose anniversary was 10 June 2011. See here! 1) Firstly, there is the actual experience of seeing a ghost. Though subjective, it is also objective. It is a real experience for the witness, however caused. 2) Secondly, there is the physical cause of the sighting. This could be a brain thing (like a hallucination) but it may also have an element external to the witness, like a tree being misperceived. Even if it has a paranorm,al cause, a sighting must eventually become a visual perception in someone's brain. 3) Thirdly, there is the witnesses interpretation of what they saw. This is subjective and usually biased by cultural expectations and the witness's own life experiences. For instance, many people will ijnterpret an unexplaioned figure as a spiurit, despite the lack of compelling evidence that it is so. When anmalysing a report, it is important to keep these three aspects separate. Regarding the experience, it is important to realise that, barring fabrication by the witness, it is completely real. People sometimes dismiss ghost sightings as 'fantasy' or 'imagination', if they don't think ghosts exist. However, in science we follow wherever the evidence leads. The evidenbce from countless reported experiences down the centuries points to ghost sightinhgs as a real exp[erience, howevrer caused. Secondly, as the experience is an objective event, it has a cause. In most cases the witness will be unaware of the actual cause. If they WERE aware of the cause they might not report it in the first place. It is the job of paranormal investigators to determine this cause. If you ask yourself, why does the witness think they've seen a ghost, the answer will be because there are circumstances which mean that there could not have been a real human present (eg someone seen in a room known to be locked and empty). Thirdly, how the witness interprets what they have seen has no bearing on 1 and 2. This last point is important! 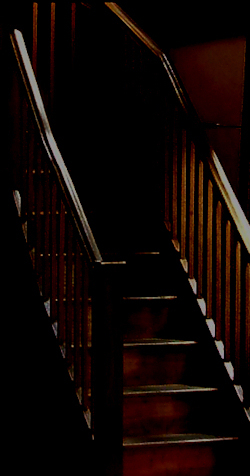 A witness may think they've seen a spirit but, while that could be so, it does not mean they have and, from experience, it is the least likely explanation for their experience. So it should have no affect on the investigation! Why am I mentioning all this? Because I have seen investigations where these three things become entangled and, unsurprisingly, the results are not helpful. This magnificent bird (right) is a Coot! As people (nearly) always say with anomalous photos, I noticed something really odd when I looked at the photo after taking it. There was nothing obviously strange visible at the time of exposure. If you look closely, you'll see two curious light brown tall thin objects in the photo. One is behind the bird about half way across the shot. The other is more central, in front of the Coot. So what are they? Some kind of flying rod, perhaps? Let's call them rods, for the sake of simplicity. Most flying rods have some sort of 'appendage' which these objects lack. But it might still be some sort of variation on the theme. So let's look at the clues in the photo. Firstly, when viewed close up (pic below right), the objects strongly resemble cylinders. There is an obvious white vertical streak just left of centre. This suggests a highlight, as if from a reflective cylindrical object, like the capsules used to contain drugs. The sharp streak suggests that the objects are in focus. The ends of the rod are rounded, like a gas cylinder. 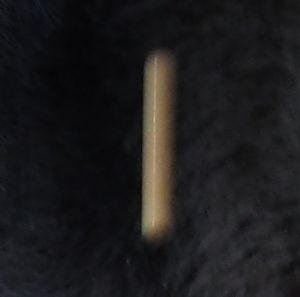 The rods are, apart from the streak, uniformly shaded and, crucially, somewhat blurred. Note, particularly, the transparent top and bottom of the cylinder, The rod shown below is the foreground object. It looks brighter, but the same colour as, the background object. Other than that, the objects look identical. Could the 'rods' be some sort of vegetation? The photo is one a series and none show any vegetation in front of the bird. Furthermore, there is no plant visibly attached to the 'rods'. The key clue is that the objects are slightly blurred. This is not because they are out of focus. Therefore it must be motion blur. The obvious conclusion is that the rods are small falling objects. This is confirmed by the fact that the top and bottom of the cylinder are transparent. That's because all of the rod consists of overlapping images of the falling object (hence the uniform colour) except the top and bottom where there is no overlap (hence the transparency). The rods are, in fact, falling seeds! The seeds came from a bird feeder directly above the Coot. Smaller birds were using the feeder and spilling some seeds onto the ground. 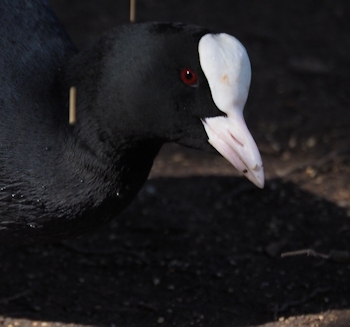 And the Coot was eating the fallen seeds. There are two such seeds actually on the back of the Coot in a later photo in the series, as well as many others visible on the ground. Falling objects could explain some UFO photos. It is always difficult to judge the size of an object that is not in physical contact with anything else in a photo. Using clues like those described here, it should be possible to detect such falling objects in photos. PS: No April fool jokes here! In our field, it's difficult enough already to decide what is real and what isn't! For a review of paranormal research in the noughties, see here. Last month's (March) website figures are an average of 11426 hits per day. This is up on the previous month's 11299 daily average.